Thank you for choosing Munson Healthcare for your care. We understand that dealing with serious health issues and the costs associated with care can be overwhelming. We want to make the process as easy and worry-free as possible. We're here if you need help understanding your bill, making a payment or seeking financial assistance. To pay your bill from one of our participating hospitals* online using Visa, MasterCard or Discover, look for the Access Code (circled below) on your statement and click the PAY NOW button below. You can also log in to our billing portal to sign up for e-statements, review your account and manage payment plans. 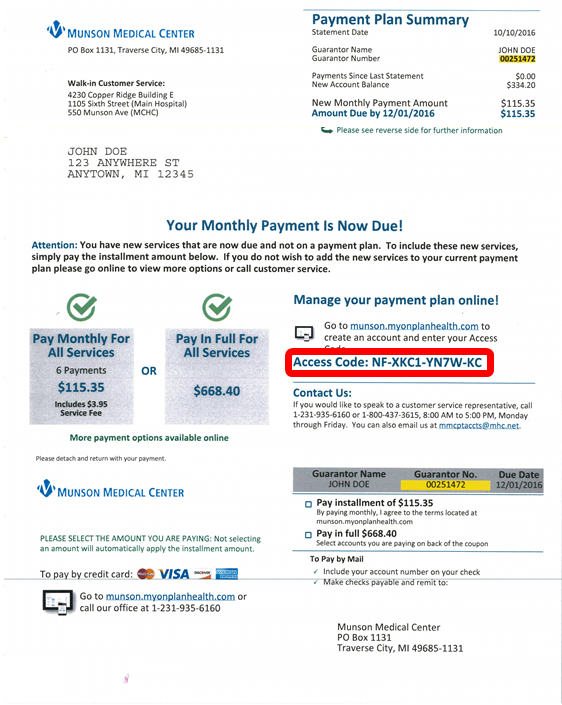 * Online bill payment is not currently available for Munson Healthcare Charlevoix Hospital, Mackinac Straits Health System or Munson Healthcare Manistee Hospital. Please use the phone numbers noted below. Click here for payments to Munson Healthcare Home Medical Equipment. If you have any questions or prefer to pay your bill by phone, please contact us at the numbers below. We accept Visa, MasterCard and Discover. Refer to OMH Billing page. If you wish to make a payment by mail, please make the check out to the entity noted in the upper left corner of your statement, address to the attention of the Billing Office and mail your payment to the appropriate address.